Ask fellow campers about "Kidder Recreation Area" and nearby attractions. Our campsite was a nice, paved back in spot with 30 amp electric and water hookups. 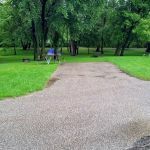 The Red River is just a stone's throw from the campground and many locals come to the park to fish, or maybe just to cruise through to the turnaround and back out creating a flow of traffic through the campground. There are restrooms and showers plus a dump station that, for some reason, is set up to be used coming into the campground rather than leaving it. There is a pay station at the campground, but if you want to call ahead and pay the city will mark a site with your name so you won't have to worry about arriving and finding all the sites taken. On our August Sunday night four of the eight sites were in use. You might want to know that the electric/water hookups are located between the sites with the even numbers having hookups on the accustomed driver's side. Mention, of course, must be made of the "World's Largest Catfish" statue which is at the campground. Since our stay was a short one I didn't set up the satellite dish, but I'm confident I would have gotten a signal. My Verizon signal was nearly full scale. 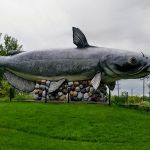 While this campground isn't a destination spot (except maybe for people who love giant catfish statues) it works as a nice place to land for a night or two. 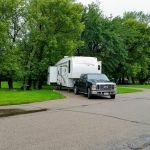 We camped at Kidder Recreation Area in a Fifth Wheel. There are only 8 sites on a beautiful fast flowing river, known for its catfish. Unfortunately, the smell from the sugar beet factory was overwhelming. The sites are very close together. Some locals starting shooting off fireworks and we could here them falling onto our rig. Finally called the police as it just went on and on. We camped at Kidder Recreation Area in a Motorhome. Small campground with only 8 sites so reservations are recommended. There is no office so payments are on the honor system. There are fire rings but I did not see anywhere to purchase firewood. Nice small campground situated along a river with a boat launch and docks for fishing. Sites where wide with green space behind each unit. Although I did not use them the rest rooms and showers appeared to be clean and spacious. Although the campground is 10 miles off I29 it is still perfect for an overnight stop. We camped at Kidder Recreation Area in a Fifth Wheel. Are you affiliated with Kidder Recreation Area ?